First of all, let me introduce myself. My name is John Peterson. 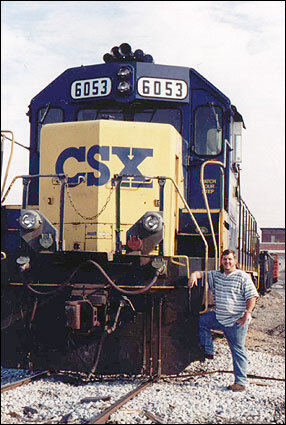 According to my parents, I have been a railfan since I was barely able to talk! I enjoy railfanning and love to scout out trains any time we are in a new area (although not always to the enjoyment of my wife! DOH!). I have been following trains in northern Alabama since the days when it was still L&N through the area. My father (who spent some time on the Atlantic Coastline) exposed me to railroading at a young age and I've been hooked ever since. As I have gotten older, I've also developed an interest in computers, and hope to develop an interface to connect my computer to my model railroad. These web pages are an exciting way for me to combine my interest in computers and railfanning. I also enjoy model railroading and am currently working on developing a freelance bridge/switching road based in Mobile, AL. For my fellow "web heads" who are interested, these pages were created using Homesite 4.5.2 and MS Notepad.exe. The graphics on these pages were done by your's truly using Adobe Photoshop 6.0 and Paint Shop Pro 7.0. Almost all of the photographs since 1996 were taken with a stock Pentax	K-1000. The rest of the photos were taken with a number of different cameras, including a Minolta SR-1, a simple Kodak 110 camera, a 126 camera and a few were even taken with Kodak's infamous Disk Camera. My hobbies include railfanning, model railroading, computers, playing guitar, car stereo, photography. I welcome all questions or comments you may have. Just drop me an E-Mail below!